DMR (Digital Mobile Radio) is an international standard for digital radios that has been in use since 2005. This mode is very popular overseas because of its reliability, spectrum efficiency, cost savings and tendency to extend battery life. In addition to the thousands of commercial enterprises using DMR, its use in amateur radio, primarily on the 70cm band, has seen a surge in recent years. With nearly 1,000 amateur repeaters already on the air in North America, DMR infrastructure is well established and is on pace to surpass D-STAR and System Fusion in 2017. DMR’s growing popularity in amateur radio is due, in part, to its technical capabilities, solid reliability and compatibility across several brands. One advantage of DMR over other the other digital modes is its spectrum efficiency. By using two “time slots,” DMR allows two voice transmissions to happen simultaneously on the same 12.5 kHz channel. DMR is also known for its superior audio quality and ability to maintain voice communication at the fringe of a repeater’s coverage area. For years, groups of dedicated hams have built up at least three networks of DMR repeaters primarily using decommissioned commercial repeaters and a lot of ingenuity and expertise. With no formal manufacturer or dealer support in the United States, DMR+, BrandMeister, and DMR-MARC are already serving tens of thousands of users. The entrance of Hytera and GigaParts into the amateur DMR community will bring resources to help buildout additional infrastructure and explore new features to support the unique needs of amateur radio operators. To make this technology affordable for amateur radio operators, Hytera ham radios will be built on the same rugged and reliable platforms developed for commercial and public safety applications, with the removal of unnecessary features, like encryption, for additional savings. Prices for handheld radios will start at under $200. All five of these new radios will transmit from 420MHz to 450MHz on either analog or digital, are built to the same quality and durability standards as their LMR counterparts, and carry a 3 year warranty. 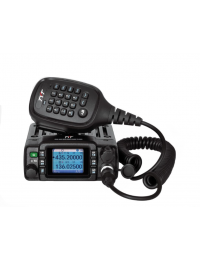 DMR radios act in a similar fashion to some of the traditional radios we have seen in the amateur radio community for years. They can operate simplex frequencies, and they can even access your traditional analog repeaters, too! You aren’t going to lose any of this traditional functionality by purchasing a DMR radio. You are, however, going to gain some really neat features. Access the World: Who wouldn’t want to be able to walk around with a HT (handie-talkie) and within a few minutes, speak to someone locally via the area repeater or internationally, simply by adjusting the radio? DMR Talk Groups offer just that; Talk Groups can be made to serve a local group, an entire region, or even have a global context to anyone who would like to join. As more and more DMR repeaters are installed around the world, more and more unique and interesting Talk Groups are being created. Simply look online for a list of talk groups, program it into your HT, and in tandem with your local repeater or access point (like openSpot or DVMega) you can talk to the world! Double the Traffic: Add to the list of upgrades that DMR offers, a repeater will have two time-slots available; meaning that two users can be on the same frequency at the same time. This allows repeaters to be able to handle local and international traffic at the same time! Your DMR radio will be able to discern where the traffic is; you can scan both channels if you like, or your radio will show a busy light on the other channel when traffic appears. Clean Digital Sound: Digital sound means that if the signal is there, you can hear it at almost 100%. No gradual lessening of your signal; the Digital Shelf means that you have almost 100% clarity to the furthest outreaches of your radio’s ability to transmit/receive. The quality of your contact will be similar to what you may experience in a cell phone call. Programming your DMR radio is a bit more advanced than programming your traditional analog radio. DMR radios also require frequency pair, color-code, time slot and talk groups; all of this after you register your radio with http://dmr-marc.net/. This will give your DMR radio your unique ID. All DMR users will have a Unique ID, but don’t worry, you can program their call sign to show with or show as their Unique ID. Some good pointers towards programming your HT can be found here: http://www.m0pzt.com/blog/amateurs-guide-to-dmr/.